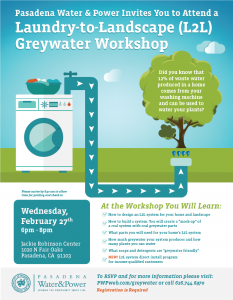 At the Laundry-to-Landscape (L2L) Greywater Workshop, hosted by Pasadena Water and Power, participants will learn about the benefits of greywater and the basic steps to install an L2L greywater system. The greywater workshop will introduce PWPs existing greywater program, which provides residents with a free on-site technical consult, and a Greywater Kit ($160 Value) which includes all the necessary parts you need in order to install the system yourself. PWP also offers a direct install of L2L greywater systems for income-qualified customers at no cost as part of this program!